When you tilt your saw blade to 22 ½ degrees by reading the indicator on your table saw, you know you are pretty close to 22 ½ , but there is a good chance it might be out a little bit. That kind of repeated variable will show up in your completed project. Your saw is capable of producing very clean smooth and accurate cuts, but you need accurate controls to make that happen. This awesome little tool quickly and easily tells you, to the fraction of a degree, EXACTLY what the angle of the blade is relative to the table top. You can reproduce EXACTLY the same angle you used yesterday. You no longer have to eyeball it or cut templates. This is repeatable accuracy that's easy, fast and affordable. 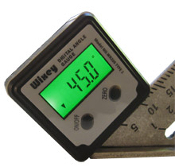 Strong magnets securely attach this gauge to the top of your table saw, miter saw or jointer table, where you set the zero calibration with the touch of a button. No need for the equipment to be perfectly level. Then just set it on your fence or blade and precisely lock in the exact angle you need. Joints are cleaner and tighter. Fit and finish is visibly improved when you can cut close tolerance dimensions. The precision readout uses what's called capacitive measuring technology. This is the exact same system that is used in almost all digital calipers that have been on the market for at least 20 years. There is a circuit board on a rotating counterweight that has a repeating pattern etched on it. There is a second fixed circuit board with a similar pattern and the rest of the electronics. As the 2 patterns pass over each other there is an electronic signal generated that is converted to rotation angle. The only moving part is the circuit board with counterweight passing over the fixed circuit board. There is no electrical connection between the 2 circuit boards and they do not even touch each other. There are no other mechanical moving parts.